Our roots go back to 1855 when the Presbytery of Hamilton ordered that a Presbyterian church be organized and elders ordained in the Town of Durham. The Reverands McKinnon and Smellie were given this duty and began that same year to construct a church building for this new congregation which would be called “The Free Church.” On March 15, 1859 the congregation was given permission by the Presbytery to seek a full time minister to fill the pulpit. On May 18,1859, our first minister, Rev. William Park was inducted. There were two Presbyterian churches here in Durham, after the introduction of organ music in the service in 1880. The group who opposed this were given permission to build a new Presbyterian church which was called Knox Presbyterian and was located on Durham Hill. 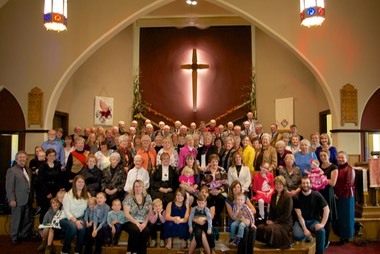 It wasn’t long before the two congregations realized they couldn’t carry on by themselves so a decision was made to unite congregations under one roof at the newly built Knox Presbyterian Church. The first minister for this united congregation was Rev. Robert McNair who was ordained and inducted on January 12, 1886. In 1925, the majority of the congregation voted for Church Union. Those who voted against union, began meeting in the Town Hall led by the Rev. B.D. Armstrong. On August 24, 1926 the cornerstone for our present building was laid, and the first service was held on December 26 of the same year.